While visiting the National Museum of American History (NMAH) you might find yourself in some of the newly opened exhibits in 3 West and as the museum fatigue sets in, you find a couch to take a break on. While you’re sitting, you look across the room at the flat screen televisions lining the wall. 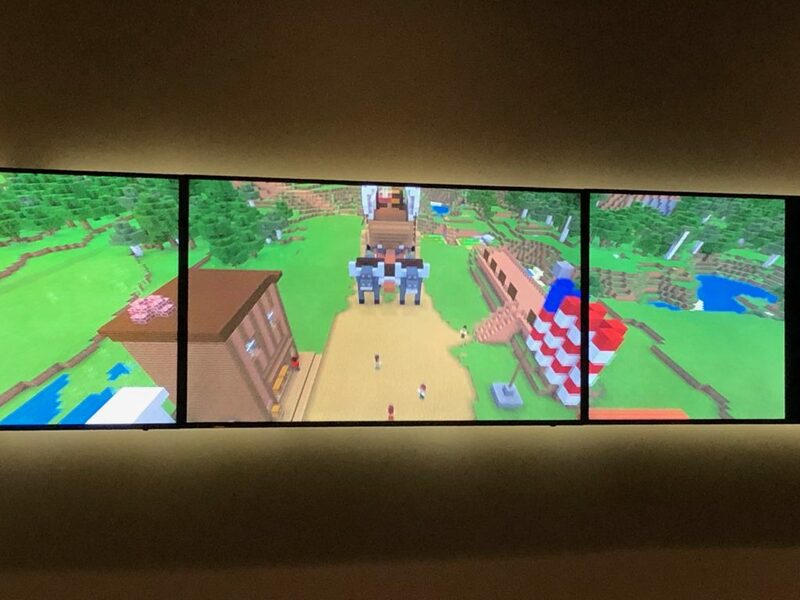 As you watch them, you might become confused as to why a museum is showing a video of a Minecraft version of the famous “Oregon Trail” video game. Next on the screen is a dystopain adaption of Washington, D.C. (Fall Out 3), then a detective walking the streets of a post-World War II Los Angeles (L.A. Noire), then a hooded figure wandering the streets of New York City during the Revolutionary War (Assassin’s Creed III). The point is- you might not have expected to see video game footage down the hall from the Ruby Slippers. While I sat there to see what other games were included, I also took the time to observe visitor reactions towards the display. For some, they excitedly pointed out to their group that they played the games shown, others were understandably confused, and in the case of an older married couple sitting next to me- while they never played L.A. Noire, they pointed at a theater being shown in the game that they actually visited. Next to the televisions is a touch screen tablet that gives more background about this display and each video game being shown. So- why is this important? 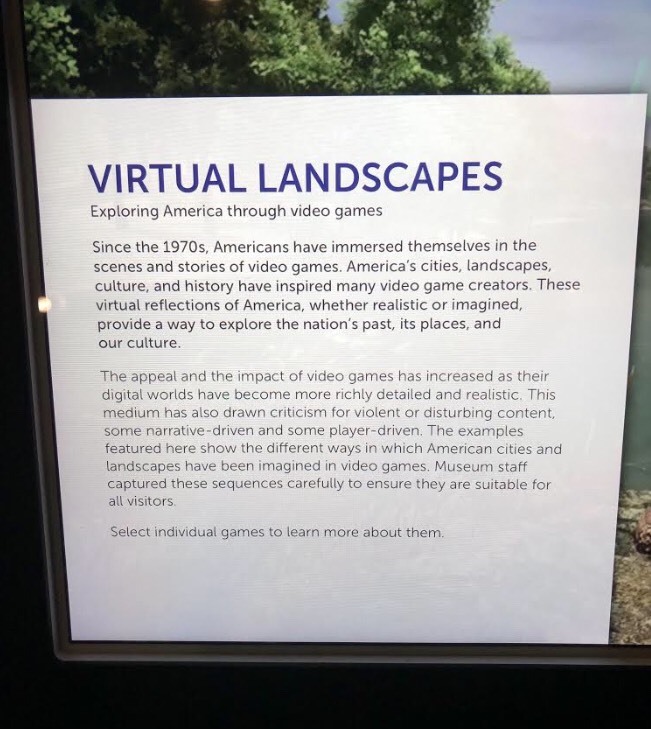 Why should video games be given attention like this by national museums, or emerging public historians like myself? In our discussion about Schmidt’s examination of the historical accuracy of language used in Downton Abbey, some in our class brought up the importance of examining the presentation of history in popular culture. This doesn’t mean as historians we’re obligated to pick apart every episode of a show or a cutscene in a video game to point out its inaccuracies. 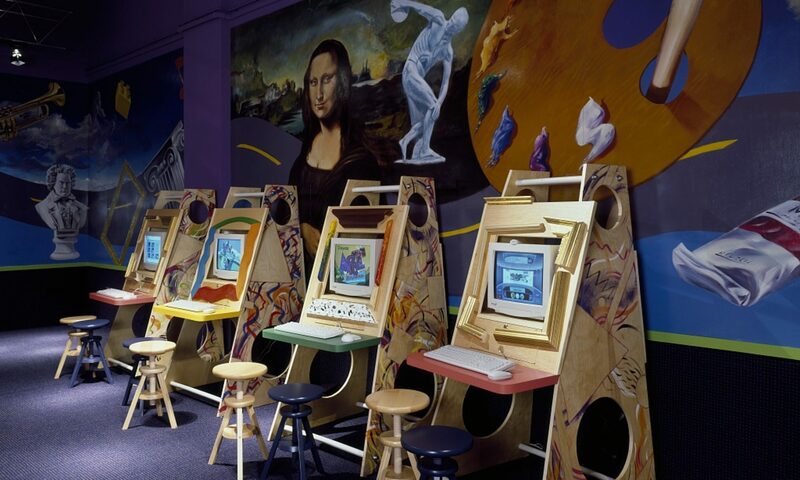 Instead, seeing digital mediums like video games as tools for historical learning can lead us to important opportunities when engaging with the public. Minecraft: Education Edition offers teachers pre-made, educational maps that they can use as interactive learning activities in class, like the Oregon Trail map seen above. Video games are not entirely accurate to the period they are depicting; however historians have been known to work with developers in creating this content. 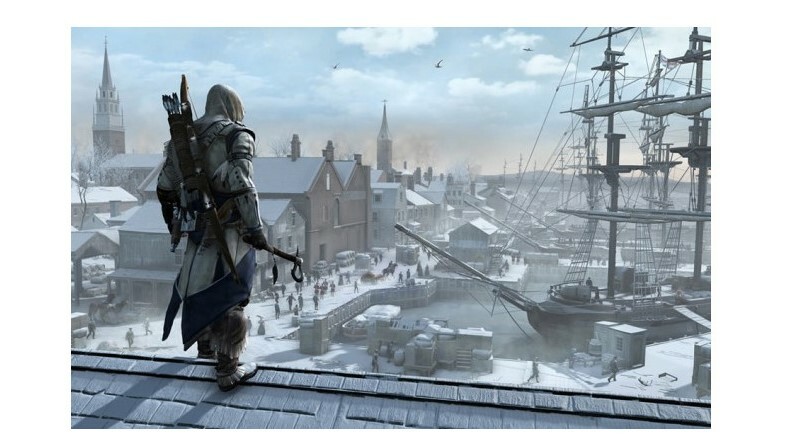 For example, Assassin’s Creed III employed the help of professional historians in the recreation of Revolutionary America. Whether they are completely accurate or not, video games are popular, and some of the most successful games in recent years have been games with historical themes. This is important to understand as historians, especially public historians, because a lot of people are constructing their knowledge about history by playing these games (or engaging with other forms of pop culture). The goal of this project, then, would be to 1.) examine how the public engages with historical video games; 2.) how historians participate in the development of such games; and 3.) discover how museums or other institutions, groups, organizations can use these resources in their interpretation of history. Great topic! I really like how you took us from the starting point for the exhibit and then stepped out to the broader issues around it. My primary suggestion on this is that if you choose to run with this as a project it would be best to try and anchor the work you do in the exhibit itself. That is, you could reach out to and talk to the curators about the ideas behind the exhibit, you could then see if you could get permission to talk with/interview some of the visitors exploring the exhibit, and then lastly you could go ahead and do your own interpretive analysis of how the impressions of visitors connect with the intentions of curators and your own interpretations of the games. That would give you a very concrete and specific set of materials to work with. If you do want to do something different, I think your main challenge is that you likely need to zero this in a lot more than it is now. 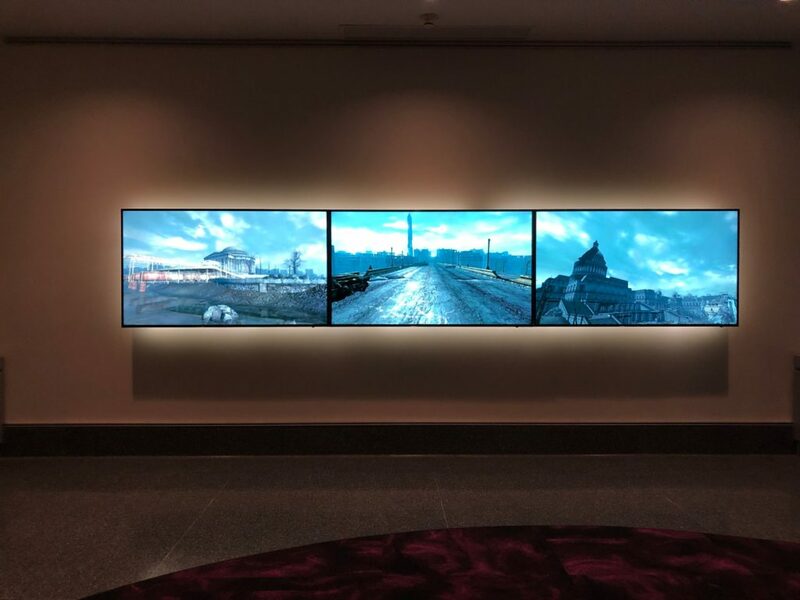 There is a growing body of research on history in video games and most of that work advances by focusing on a specific game or specific set of games in a particular context. So you could do something on public memory and The Oregon Trail, or on how history functions in Carmen Sandiego, etc. But it would likely work best if you find a way to zoom in on a few titles or contexts.